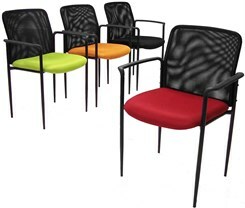 Mesh Guest Chair with 4 Exciting Color Options! In Stock! Free Shipping! 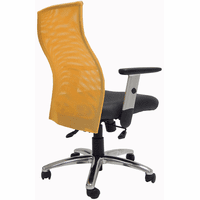 Our trend setting mesh guest chair is an attractive and comfortable solution for a wide variety of office uses. Versatile for use in reception areas, conference rooms or seminar rooms. Available in four interesting colors to liven up your office. Or, mix it up with all four colors to really add a colorful splash. A sturdy steel tube framework serves as a solid foundation for this stylish chair. Black fabric mesh is stretched across the angled backrest for a comfortable and contemporary appearance. The dense foam seat cushion offers extended wear and is upholstered with a foam/mesh material to offer a high-end look and feel. A gentle contour on the seat pan nicely fits the backside along with a waterfall front edge to ease restriction of bloodflow in the hamstring area. * Taught black mesh backrest for breathability and progressive design. * Powder paint coated tubular steel frames. * Molded cap arms for forearm comfort and scratch resistance. Seat measures 18"W x 18"D x 19-1/2"H. Arm height is 25-1/2"H. Measures 24"W x 24"D x 33-1/4"H. Ships unassembled. Shipping weight 17 lbs. All components exceed ANSI/BIFMA commercial use requirements. Meets CA fire foam approval. 5-Year Limited Warranty. PRICE INCLUDES SHIPPING! IN STOCK!